June 8, 2016 – This image of Mars was taken on March 27, 2016 by the High Resolution Imaging Science Experiment (HiRISE) camera on NASA’s Mars Reconnaissance Orbiter. Sand dunes cover much of this terrain, which has large boulders lying on flat areas between the dunes. 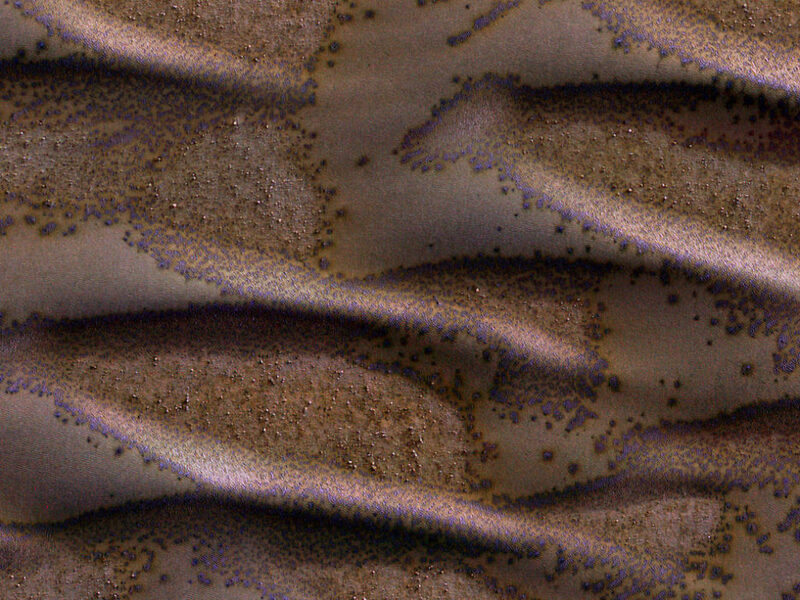 It is late winter in the southern hemisphere of Mars, and these dunes are just getting enough sunlight to start defrosting their seasonal cover of carbon dioxide. Spots form where pressurized carbon dioxide gas escapes to the surface. The University of Arizona, Tucson, operates HiRISE, which was built by Ball Aerospace & Technologies Corp., Boulder, Colorado. NASA’s Jet Propulsion Laboratory, a division of the California Institute of Technology in Pasadena, manages the Mars Reconnaissance Orbiter Project for NASA’s Science Mission Directorate, Washington. Lockheed Martin Space Systems in Littleton, Colorado built the orbiter and supports its operations.